Our softwares are free for everyone. If you do not yet own a 3DMS but you want to test its possibilities, you can download our softwares and try it as 3DMS Manager comes with an example file. 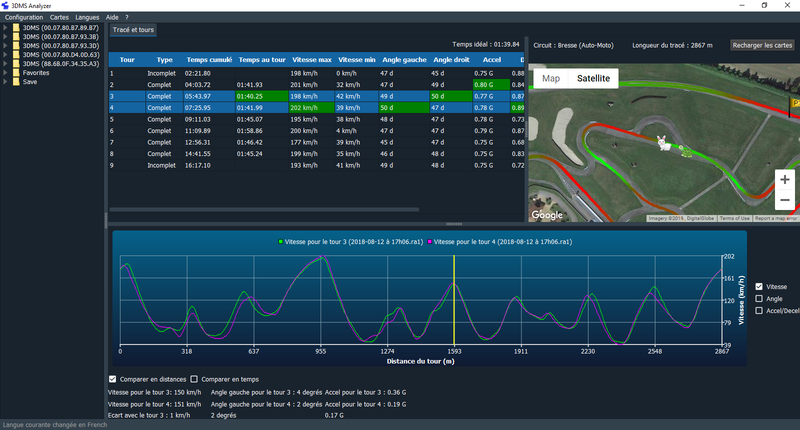 3DMS Manager gives you the possibility to analyze your performances (timers, paths, …), see your embeded videos with lean angle, acceleration/deceleration, timer, position and speed superimposed on it, and to edit your maps (tracks, coast race, …). It works with Microsoft Windows. The .exe file had been zipped to avoid anti-virus problems on download. 3DMS Analyzer works in addition of 3DMS Manager. 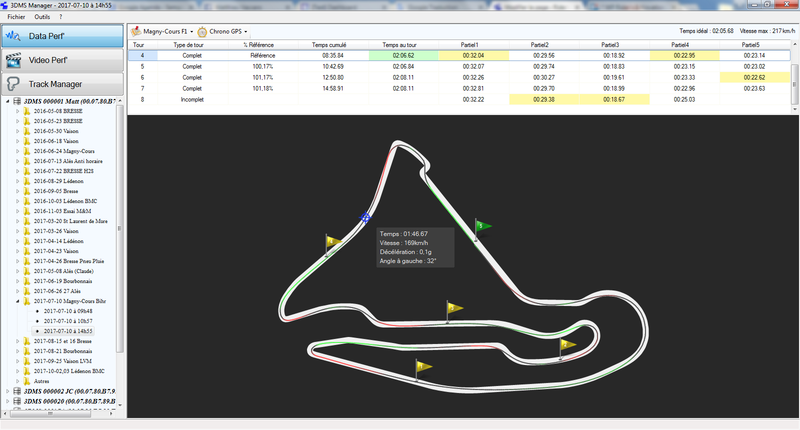 It allows analyzing the performances measured by the 3DMS. It works with Microsoft Windows 7, 8 and 10 64 bits. If it displays an error window as “VCRuntime140.dll […] missing”, download and install Redistribuable Microsoft Visual C++ 2017 package from Microsoft website. Before using software menu (as changing language), select a 1st 3DMS record (for example, “Example of file” on “Favorites” folder). Then right click on white area (at top right) and select “Reload” to display satellite view. Then you can use menu and all the app! The .exe file had been zipped to avoid anti-virus problems on download. Firmwares are automatically updated. You just need to connect 3DMS to PC by Bluetooth, connect PC to Internet and start 3DMS Manager (last revision is better). You could see yours 3DMS and Display firmwares revisions on “Display management” menu and on “Tools”=>”3DMS Management” menu of 3DMS Manager.